We used to look for shapes in the clouds when I was a kid. They form in the shapes of animals all the time. 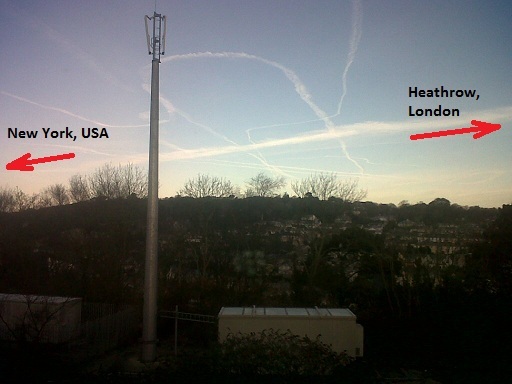 I think it has something to do with dna structuring the clouds that makes them do that. DNA structures our cells and effects the shape of every living thing. I feel it can effect the shape of all sorts of matter, including clouds. It wouldn't always happen, the right minerals in the air would be necessary. The right chemical structure of the clouds would need to be present too, and the shape would just be basic. Hail is formed by the presence of microbes sometimes, so what I am saying is not such a far fetched possibility. People and their dogs even start to look alike sometimes. Clouds tend to be formed from vortex tubes and vortex rings. A vortex tube is something like a tornado or the contrails behind an airplane. Vortex rings then appear as thin lines of white fluffy clouds. That's enough to make arms and legs. To make the simplest face, we just need two white patches of cloud to make eyes and a long line to make a mouth. Slower moving clouds form fluffy spherical shapes. To make evil looking faces you need more wrinkles and detail. That happens when there are storm clouds. I saw one video where the clouds looked like snarling faces. That intelligent entity might as well be your conscience, and it being intelligent or not, will be up to you. Viewer an listener discretion will advertised, by your own accordance of free will. If it was God giving you a positive response, did He remove the negative entity that is attached to you ? Did your parents do anything out-of-the-ordinary with you when you were a child ? Sometimes when a person asks for who is the root of all evil, God gets a chemtrail to form a 'S' for Snake / haSatan. Its not healthy to indulge peoples delusions, it will only make it worse in the long run. Perhaps you too need to return to your meds. Truth hurts the weak. Especially when a picture speaks a thousand words and mocks the 'S'tupid 'S'atan for being such a easily outwitted old fool. Take a deep breath, breath in all those smiley face nanites from the chemtrails and move along, nothing to see here. Leave the truth with the pro's, the ones who can handle the facts. Says the person whose post makes absolutely no sense. Its almost like youre trying to communicate, but just stringing words together nonsensically, in an effort to sound enlightened. Oh wait, no thats exactly what youre doing. Also , Jet pilots also drew a giant willy in the sky with chemtrails, guess that was god telling satan to eff off eh?